Address: 1900 Heritage Drive S.W. Cost: $25.73+gst person ages 2+ (2018). 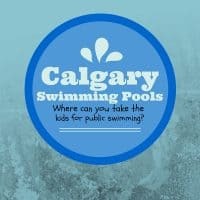 Not included with regular membership. Suggested Age Range: All ages of Thomas the Tank Engine fans. Day out With Thomas was back at Heritage Park again this year to the delight of many little Thomas fans. 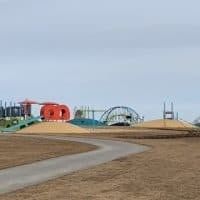 As usual, it is held over two weekends in May just before the park official opens for the year. This year, they also added an additional Friday. Here’s how to make the most of your day. Admission for this event is not included with an annual pass. It is highly recommended that you buy your tickets in advance, especially if you are looking for a mid-day ride. There are usually a limited number of walk-up tickets, which are available at the front gate on the morning of each event. Tickets are $25.73 + GST per person for the train ride and all of the Thomas activities in the park. If you miss out on those, there are also an unlimited number of walk-up tickets available for park entry only at a reduced rate. That means you can take part in all of the Thomas activities, but you do not get to ride the train. 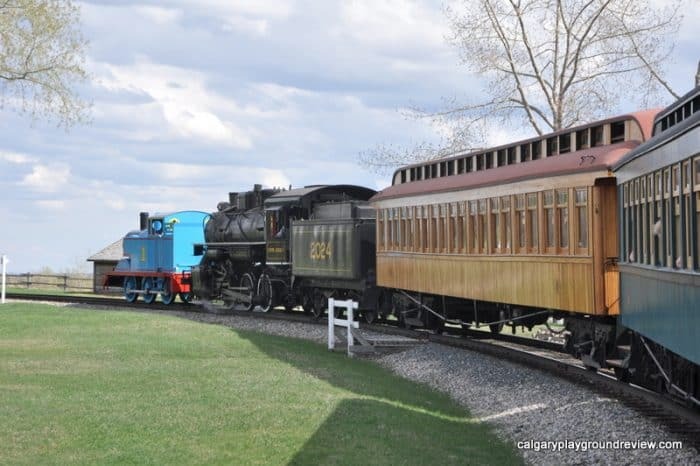 More information is available on the Heritage Park website here. 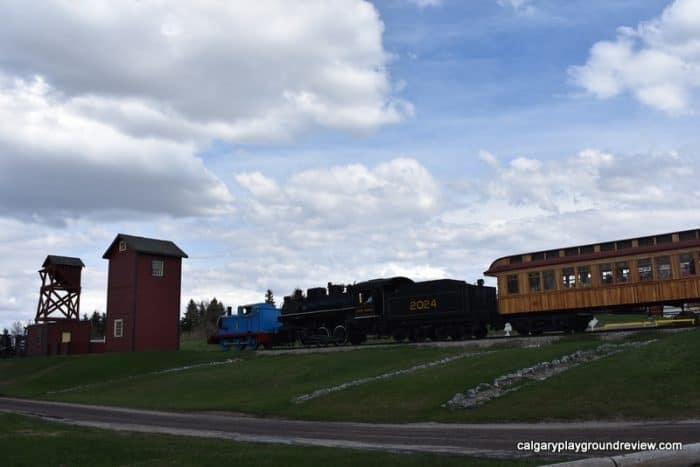 Heritage Park has introduced a $5 flat fee for parking. They use the park plus system so if you have the app you can pay with your phone, or they have terminals by the parking lot and by the park entrance (which usually has less of a line). Thomas loads and unloads at Midnapore station, and you can walk right up to the front of the train and take your kids’ pictures with him. When he sets off, he has a short speech – his mouth moves! You can’t hear this from inside the train, and it’s worth waiting a few minutes for. 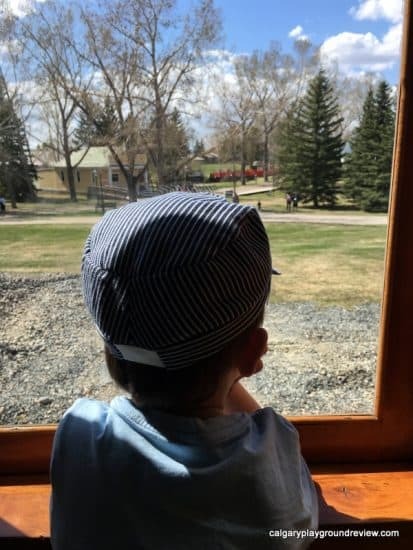 Because the train tracks wind around the park, you’ll find that you have lots of opportunities throughout the day for your kids to see Thomas chugging along. 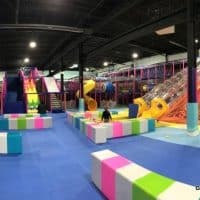 This was one of the most exciting things for my 3 year old. You should line up for your ride at Midnapore Station about 20 minutes ahead of time. There is no assigned seating, so pick any line-up you like. For the best view of Thomas as you go around the tracks, you want to be near the back of the train on the left hand side. The last car will usually have a big line but you can still see well from the 2nd to last car. The train does three laps around the park which ends up being just about right. 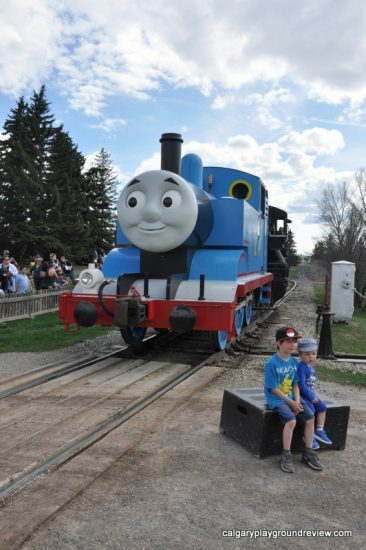 There are several stations set up with Thomas-themed activities. Your kids will get sheets to stamp at each station, which you can turn in for a smallprize on your way out of the park. 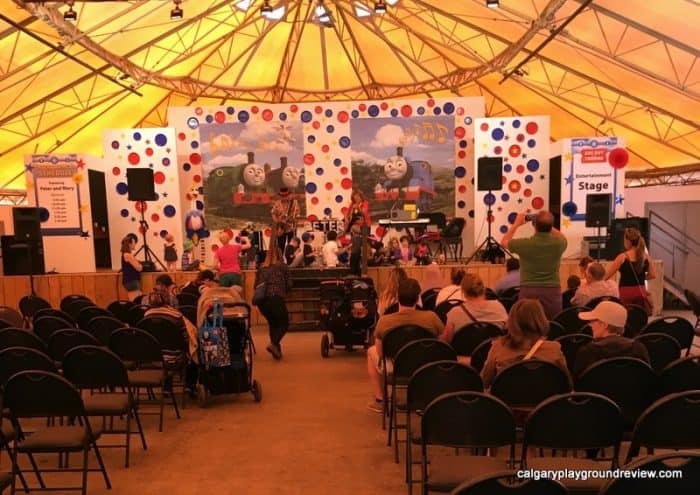 Over at the tents, they have a Thomas gift shop (with a small train table the kids can play with) and an activity area with temporary tattoos, face painting coloring pages and performances. 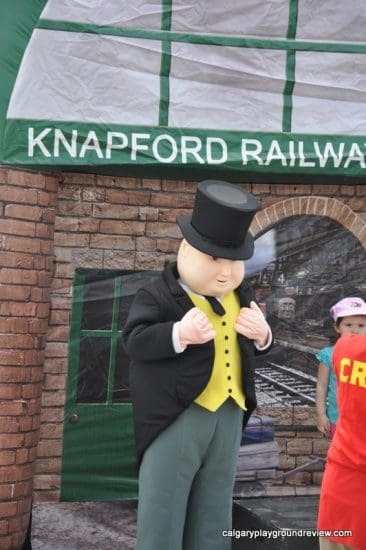 This is also where you could meet Sir Topham Hat. Over at the Opera house on the other side of the park they had videos and story telling. 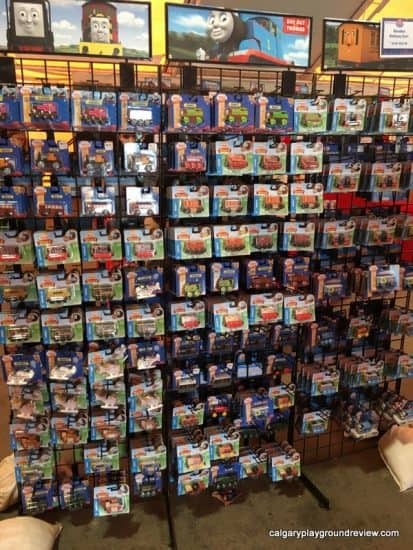 The gift shop is filled with every kind of Thomas related merchandise you can think of. 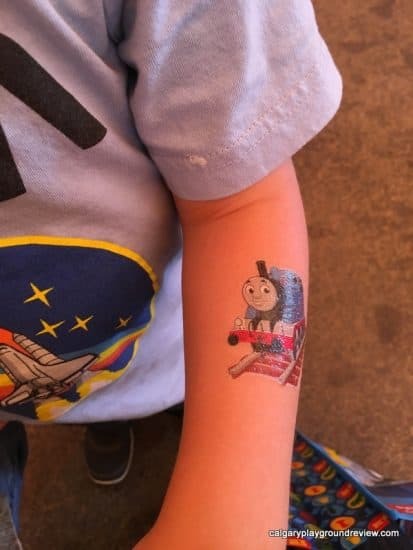 My youngest who is a huge Thomas fan loved getting a temporary tattoo. He decided against getting a photo with Sir Topham Hat this year. 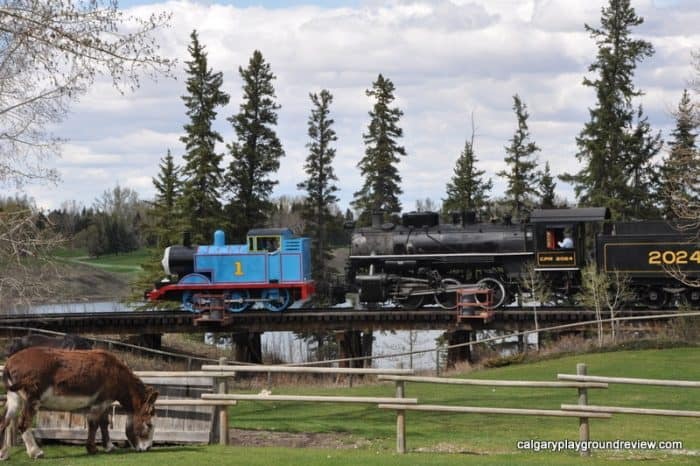 You can also catch a ride on a horse drawn wagon (which tends to have shorter lines than regular Heritage Park days). 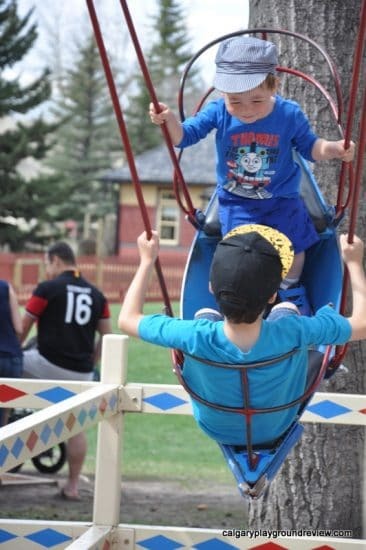 Some of the rides are also running – usually the small ferris wheel, boat swings and carousel. 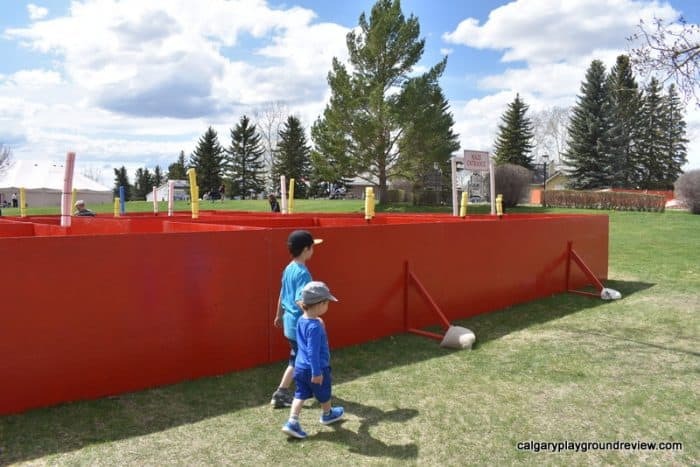 They also have two wooden mazes set up. One for really little kids and one for kids that are a bit older. 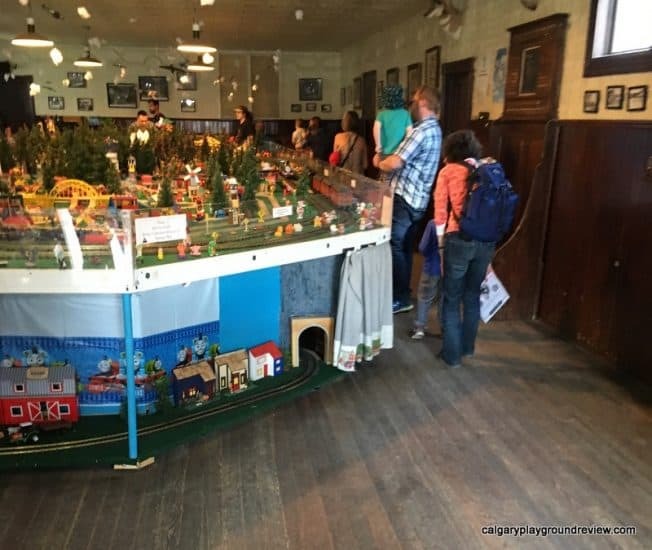 Don’t forget to stop inside at the model railway display. You have a few options for food during Day Out with Thomas. 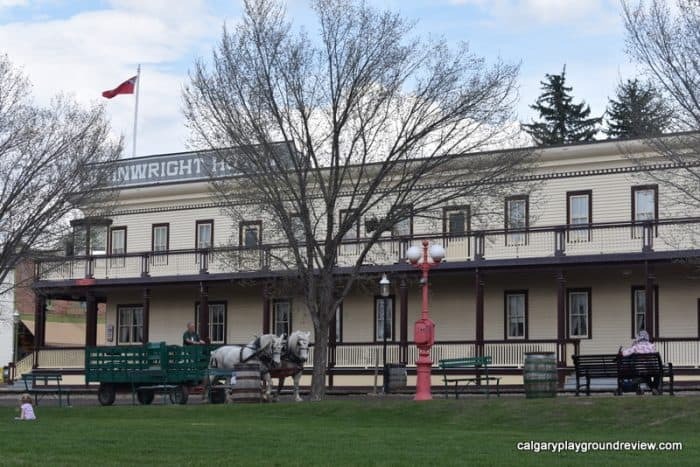 A family-friendly lunch is available in the Wainwright Hotel. There is also a concession at the Thomas tents with hot dogs, chips, popcorn, and drinks. The ice cream shop, candy store and bakery are also open. You should definitely stop at the bakery – the lines are usually way longer. 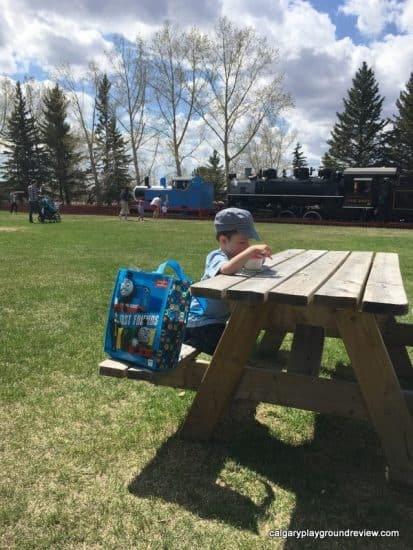 You can also bring in your own food and have a picnic on the grass or at one of the picnic tables around the park. You can also spot a few animals at the park, this year we saw lots of horses. 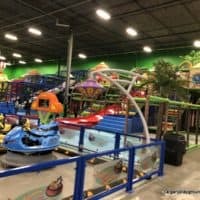 We’ve been to Day Out With Thomas many times since my oldest was a toddler and always had a great time. 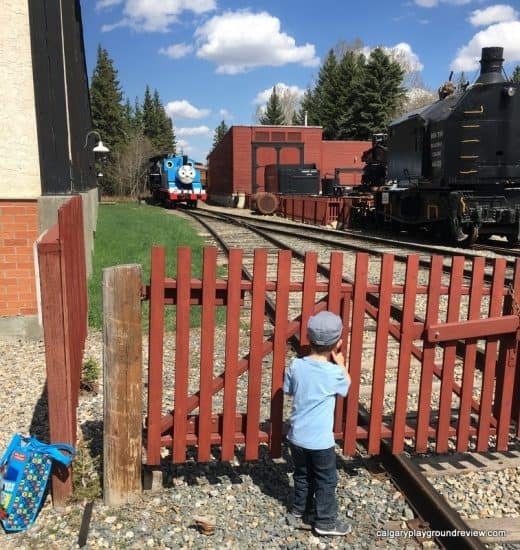 This year, seeing Thomas and getting a ride in a train that was pulled by Thomas was a magical experience for my 3 year old. 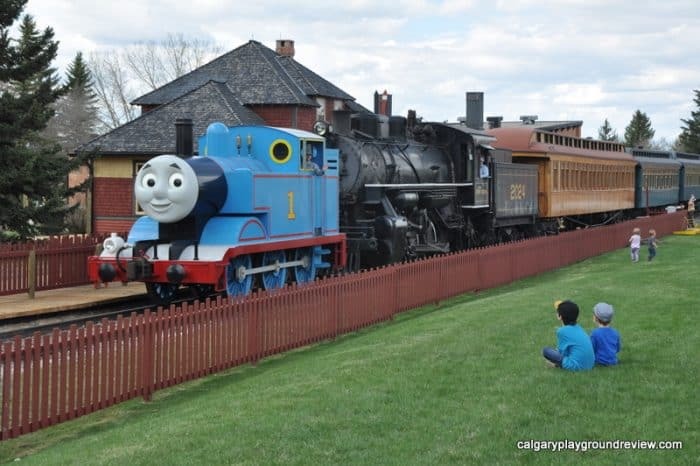 If you have a Thomas the Tank Engine fan in your family, I bet you will have a great time too. 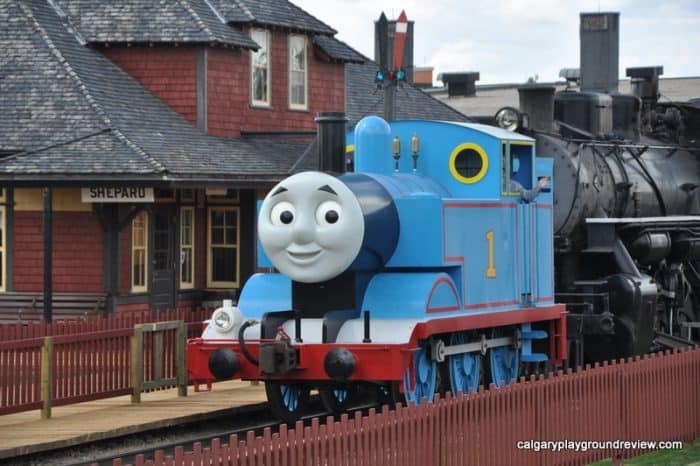 Have you ever been to Day Out with Thomas? Do you have any other tips for making the most of the day?